TouchPoint One, a leading provider of cloud Contact Center Performance Management software today announced that its CEO, Greg Salvato will be speaking at the 2014 ICMI Contact Center Demo and Conference to provide an overview of Contact Center Performance Management solutions including a case study featuring TouchPoint One customer Convergent Outsourcing’s Acuity CCPM implementation. Greg will be joined by Convergent Outsourcing President, Casey Kostecka who will lead a presentation and discussion of the Convergent case study. In addition to the CCPM primer and case study, the agenda will also allot time for attendee Q&A. Be provided with a comprehensive overview of Contact Center Performance Management (CCPM) solutions, their core components, features, objectives, value proposition, ROI potential and more. Hear how Convergent Outsourcing, a 2600+ seat outsourcer improved attendance, attrition, CSat and dollars per contact through better performance management and execution leveraging CCPM. Gain insights through an insider’s look into Convergent’s CCPM journey – from initial SWOT analysis, through implementation, to results and lessons learned. Discover how identifying the key metrics that drive business success, aligning them with targets & incentives, analyzing performance against targets, and implementing improvement plans can be the recipe for performance management success in your center. Explore how CCPM can be leveraged to address top priorities within the contact centers of session attendees. Greg was appointed CEO of TouchPoint One in 2013 and brings to its clients and stakeholders executive management experience in the business, financial and technology sectors. Greg began his professional career at CUC International (Cendant Corp.) and is an active investor and advisor to several entrepreneurs and early/seed-stage companies. Casey Kostecka, President – Convergent Outsourcing, Inc.
Casey has more than 20 years’ experience building and improving business operations in a variety of corporate settings, ranging from government contracting to international travel operations. Casey’s career includes assignments at Cendant Corporation, Aspen Systems, National Leisure Group and Applied Computer Services (ACS), before joining Convergent in 2010. TouchPoint One delivers innovative performance management solutions to the world’s leading contact centers. 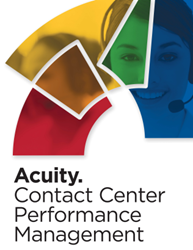 The Company’s Acuity product is a Cloud-hosted (SaaS) Contact Center Performance Management platform that assimilates disparate systems data and applies role-based dashboards, intelligent workflows, data analytics, messaging and game mechanics to establish organizational alignment, drive progressively improved financial and operational performance and enhance the customer experience.